Cajun Chef Cayenne Pepper 20 oz. 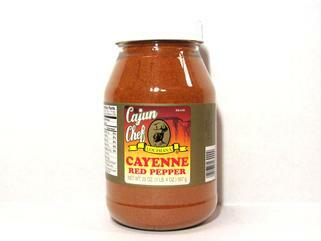 Home » Products » Cajun & Creole Seasoning » Cajun Chef Cayenne Pepper 20 oz. Cajun Chef's Red Cayenne Pepper gives dishes extra spice. You don't have to use a lot to make a dish spicy with cayenne pepper. Cayenne Pepper is perhaps the most popular spice in Louisiana cooking. What most people don't know is that cayenne pepper is a Spanish influence that was adopted by the Cajuns when they migrated to Louisiana from Canada.